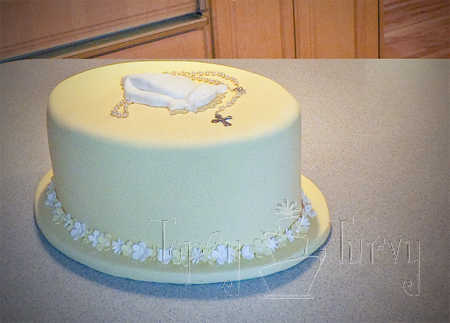 This cake was for a first communion. The grandmother ordered this cake from out of town. I worked with the mother and daughter on the design. They wanted 3D praying hands with a rosary. They were pleased and I thought it turned out as well as it possibly could! Just don’t turn me into Cake Wrecks for having body parts on a cake! We didn’t want the hands to be all Skin and veins ans stuff so we put them in white gloves. I was pleased with how well the lace edging turned out. I used molded chocolate and covered it in a thin layer of fondant. The rosary is real. 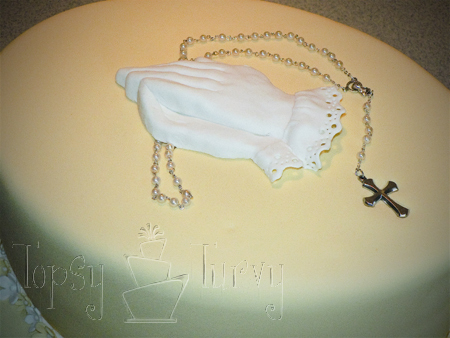 I was going to make fondant, but the hands were so small and delicate I felt that I fondant/gumpaste rosary would take away from it. So I went with a pearl and silver childs rosary to fit the small hands better. Previous Post: « Make your own personalized ribbon!